A unique and beautifully refurbished Grade II listed Georgian home with a wealth of warmth, charm and character. This spacious and versatile home with four bedrooms, three reception rooms and study offers interesting living space which could be suitable for dual family living. The double garage has vaulted ceiling and could provide a great workshop, or even potential to convert to a holiday let, subject to the necessary consents. Originally the 'Old Village Inn' dating back to the18th century, The Old George retains many character features reminiscent of that era and is now ready for its next custodian. OVERVIEW A unique and beautifully refurbished Grade II listed Georgian home with a wealth of warmth, charm and character. This spacious and versatile home offers interesting living space which could be suitable for dual family living. Originally the 'Old Village Inn' dating back to the18th century, The Old George retains many character features reminiscent of that era and is now ready for its next custodian. Reception Hall  timber and glazed door leads to welcoming reception area. Utility/Boot Room  red quarry tiled floor, oak work top with 'Belfast' sink, space for washing machine and tumble dryer and high level shelving with coat hooks. Cloakroom  white two piece suite and red quarry tiled floor. Dining Kitchen - light and airy offering fabulous family/entertaining room with space for a large table and chairs. This cottage style kitchen with original red tiled quarry floor and exposed beams is well appointed with cream 'shaker' style units and oak work top with complimenting central island. Fitted appliances include; fridge freezer, drinks cabinet, dishwasher, oven and hob. Door leads to under stairs storage area with further door to side providing access to first staircase. Drawing Room - beautifully presented with bay window to front aspect, feature fireplace with timber surround and tiled hearth housing 'multi fuel' stove and original fitted corner display cabinet. Sitting Room  light and fresh with dual aspect windows, wooden flooring, step up to large original door, second stairs give access to first floor. Garden Room  accessed from the kitchen and second sitting room this light and bright room has vaulted ceiling, tiled floor and French doors leading out to the gardens. Landing  low level galleried landing. Master Bedroom  light and bright with dual aspect windows, original cast iron fireplace and picture rail. Feature small doorway interconnects into bedroom three. En-suite  white two piece suite and corner shower cubicle with power shower, heated towel rail and tiled floor. Dressing Room - step down, exposed beam and window to front aspect. Bedroom Four  vaulted ceiling with exposed beam. Bathroom  white three piece suite with power shower over bath. Study  vaulted ceiling with 'Velux' window and exposed beam. 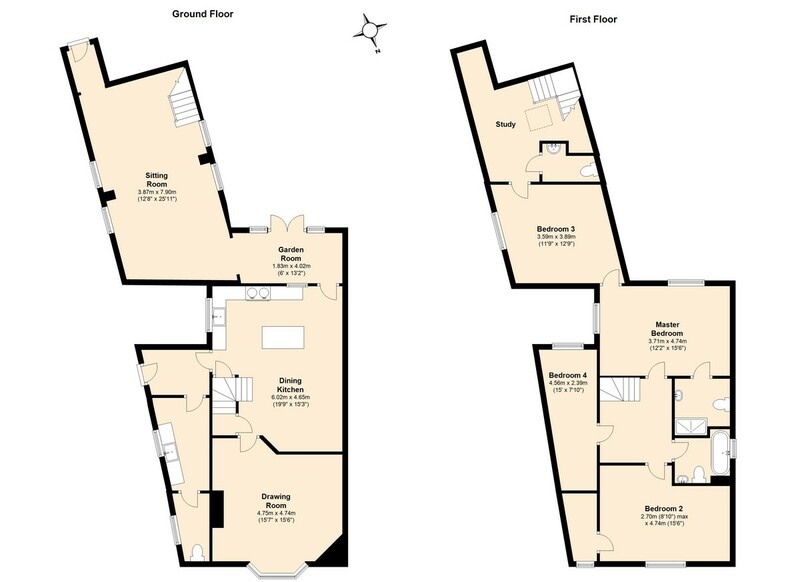 Cloakroom  white two piece suite and tiled floor. EXTERIOR Double garage to the front of the property which has vaulted ceiling and could provide a great workshop, or even potential to convert to a holiday let, subject to the necessary consents The rear garden is 'cottage' style and is a real delight perfect for 'Al fresco' dining. The walled garden with patio and corner raised flower bed has steps leading to further area of garden which is enclosed with timber fencing and has abundance of climbing flowers and shrubs. Greenhouse and timber shed are also included. LOCATION Dymock is a thriving village, which won village of the year in 2016, boasting two garages, post office/village store, church, village hall, village green, public house, cricket club and golf course. There is a hive of village activity throughout the year to include annual half marathon and music festival. The public house in the village is owned by the local parish. The old canal basin has been reinstated which now links Gloucestershire and Herefordshire.